JACKSONVILLE – The Jacksonville Sharks (0-0) are set to kick off the season this Saturday, April 13, against the New York Streets (0-0) in the National Arena League Season Opener. The stage is set for a historical night as the Sharks host their first season opener at home ever as well as begin their 10th year as a franchise. The Shark's week one opponent is the NAL expansion team the New York Streets who will play their inaugural game in right here in Jacksonville this Saturday. This season, the Sharks will have a new Quarterback at the helm after signing former Mammoths star Jonathan Bane. With him, former Maine Mammoths All-NAL Wide Receiver and 2017 National Arena League Champion Devin Wilson returns to the Sharks for 2019. Wilson finished last season with the Mammoths as one of the top three receivers in the NAL. Joining Wilson in the receiving core are the other two top receivers Jarmon Fortson and Durron Neal both coming from the Columbus Lions who finished last year with a loss in the National Arena League Championship. 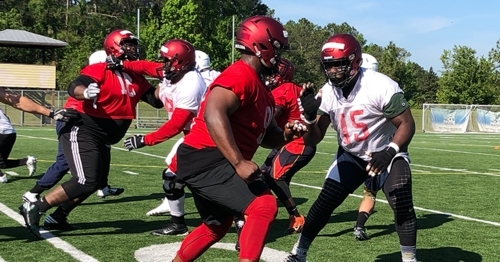 Fortson and Neal both look to finally win that NAL title with the Jacksonville Sharks in 2019. The Sharks arguably now have the best passing game in the National Arena League, at least on paper. Also returning to Jacksonville are two starting Sharks receivers from 2018, both Cody Saul & Chris Gilchrist will be a part of this stacked roster. On defense the Sharks have two returning All-NAL linemen Damien Jacobs and Keith Bowers look to wreck havoc on the Street’s 230 pound Quarterback David Legree. Sharks QB Jonathan Bane will face former teammate Edgar Poe who will be playing for the Streets in 2019 who looks to be a star in the Big Apple with the Street. . The Sharks secondary will feature all new names this season. 2018's secondary unit struggled in the second half of the season with big upset loses in both Maine. It’ll be interesting to see if Burley’s re-built secondary will prove to be enough on Saturday night. The Sharks offensive line will also feature new faces but will return one of the biggest faces from the Sharks 2018 season First Team All-NAL Lineman Derrick Ziegler who will play a major role in Jonthan Bane’s success or failure this year along with the success of the Sharks All-NAL receiving core. The return of Ziegler may be the final piece and the most vital one in this making this All-NAL dream roster into a NAL Championship contender. The Sharks decided this season not to shake things up with the kicking game by returning kicker Brandon Behr, the former Jacksonville University and USF product who finished 40 for 54 in PATs and completed six field goals and two deuces for the Sharks.